How about field marrow dosas for breakfast tomorrow? Did you know you can make delicious dosas using field marrow? Who would've thought right? We South Indian love dosas. And from ages they have been made interesting by adding cucumber, watermelon, field marrow, different types of lentils etc, to the dosa batter. I love to make these field marrow dosas even more not only cuz everyone who has it enjoys them, it's also way too easy to make. 10 minutes of prep at night, 10 minutes to make dosas & chutney the next morning. Carefree, delicious, filling breakfast. To make them you'll need a simple, fine, batter of rice, filed marrow, grated coconut, beaten rice & salt. 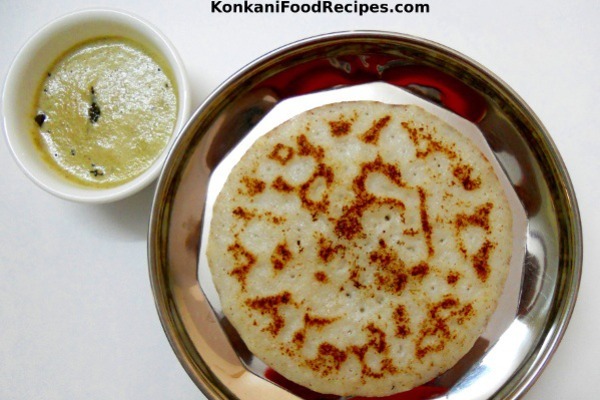 You can also make sweet Mangalore cucumber dosas for your kid and for yourself. Devour them with ghee on top! Here goes the recipe.. But there's one thing you need to know before you begin.. The batter for this dosa has to be prepared 7-8 hours before making the dosa, as the batter needs to ferment well. This dosa tastes great only when the batter is well fermented, the more the batter ferments the better the dosa tastes. Prepare the batter the previous night of the day you wish to make the dosa for breakfast and let the batter ferment over night. 7-8 hours of fermentation is enough if the weather's hot, 12-15 hours of fermentation is needed if the weather's cold. When the batter has risen a little, you know the batter has fermented well and is ready to make dosas. 1. Soak rice for a minimum of 30 minutes. After soaking wash it well & drain all the water. 2. Peel, deseed and roughly chop field marrow/Mangalore cucumber. 3. Wash beaten rice once, drain all the water. This softens beaten rice. Beaten rice adds softness to dosas. If you are using thick variety of beaten rice, they'll need soaking. Soaking time depend on the thickness of beaten rice you use. 10-30 minutes. 4. Grind rice, grated coconut, beaten rice, chopped Mangalore cucumber, salt, jaggery into a smooth paste without using any water. Mangalore cucumber gives out enough water while grinding, to make a smooth batter. Also, we want a thick batter, so do not add any water while grinding. Grated coconut makes soft dosas. It also adds the required taste to these dosas. The more grated coconut you add softer & delicious dosas you make. 5. Transfer the finely ground batter into a vessel, close it with a lid and allow it to rest for atleast 7-8 hours. During the resting time, fermentation takes palce. The more time you allow the batter to rest, the more it ferments. The more the batter ferments, the better your dosa tastes. Adding salt fastens the fermentation during the resting period. 6. After 7-8 hours the well-fermented batter rises and is ready to make dosas. It gets well aerated. Give the batter a nice mix and make delicious dosas. 7. Heat up a frying pan, take a ladle full of batter and make beautiful round dosas. Spread them only a little. Beautiful craters are formed if your batter is well fermented. Cook closed until the top of the dosa is completely cooked. You know this from the change in colour. The thicker the dosas, the fluffier they get. I personally like them medium thick, so spread them just a little bit. 8. Drizzle oil on top & flip the dosa. Cook it for 2-3 minutes or until it just starts to brown on the other side. 9. Serve dosas hot with loads of home made butter on top and with a spicy coconut chutney. 10. Keep remaining batter in the fridge for future use. If the batter hasn't fermented enough, keep it outside for a few more hours so that it ferments further. You can later store it in fridge for further use. 1. By adding powdered jaggery to the batter you can make sweet Mangalore cucumber dosas. They taste yum and I love both the sweet and non-sweet versions of this dosa. 2. The amount of powdered jaggery to be added depends on your palate, depends on how sweet you would like your dosas to be. 3. All you need to do to make sweet Mangalore cucumber dosas is add powdered jaggery to the above batter and mix well. 4. You can add powdered jaggery to the fermented batter or add jaggery to the batter before fermentation. 5. However, when you add lots of jaggery to make the dosas sweet, do remember jaggery dilutes the batter. So, keep the batter thick if you want to make sweet dosas out of it. 6. Make dosas as mentioned above. Eat them as-is without any accompaniment or with ghee/butter on top or with a spicy coconut chutney. Let me know how your dosas turned out to be. And which version did you like the most. The sweet or the non-sweet dosas? Do try out the recipe and let me know how delicious it turned out. You could even connect with me on Twitter, by doing so you could tweet any queries, suggestions you have about any of the recipes and I would be glad to help you sort things out!